So, you just brought a cute little kitten home. Welcome to the world of adorable cat videos and sweet-sometimes-annoying meowing wake-up calls. But before you get too cosy with your new feline friend, make sure you know the basic cat care tips—such as the vaccines, litter training, and food. The right food to feed your cat is really up to you and your vet. However, any food you feed your pet—wet or dry—should be specially formulated for cats. Their diet should be more on protein than carbohydrates, and no servings of any raw food. Access to plenty of lukewarm water is of utmost importance as well. Milk is a no-no as many cats develop digestive problems with it. When buying litter boxes, buy one for every cat you have. Go for larger litter boxes with ramps or low entryways, placed in a quiet but accessible part of your house. Make sure to clean litter boxes every after use; cats don’t like dirty areas, and would rather urinate in clean carpets than in dirty litter boxes. 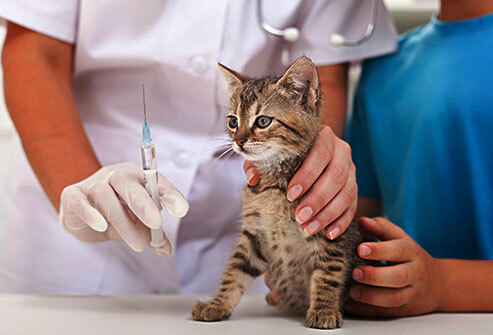 Healthy cats should have routine vet check-ups at least once a year, and this should begin at around eight weeks of age. When going to the vet, talk about prevention treatments especially for fleas and heartworms. If your pet shows signs or lethargy, diarrhea, constipation, persistent vomiting, or if he has not eaten or drank for the last 24 hours or urinated in the last 12 hours, bring him to the vet right away. Playing is great exercise for cats, so spare 10 minutes twice a day to play around with your little furball. When looking for kitten toys, some of the favourites include laser, cat nip mice, small balls with bells inside, and anything with dangling feathers. Just like you, your kitten has soft spot for sweet treats as well—but be careful when rewarding him with food. Some cats avoid their meal in preference for treats. Limit the treats to a few times a week, and only using them as a reward for something special, such as after playing or a successful training. When raising kittens, it’s pretty similar to that of raising children. If you provide them with proper shelter, care, and training while they’re still young, you can expect they’ll grow up healthy and disciplined. So if you have recently adopted a cat, keep these kitten care tips in mind.